As we enter another decade of the Internet, perhaps it is time we look back at what has come before in social networking, and where it may be going in the future. Lets start with the 1980’s. Yes … I said the 1980’s. Those of us who were tooling around with 9600 baud modems in the 1980’s were pioneers in social networking, although we had absolutely no clue that is what it would eventually be called. I first got a modem in the mid-80’s, and in Sept. 1986 I got serious about trying to find things to do with it. First up were the local bulletin boards (BBSes) which were one of the earliest forms of social networks online. Most of them were local services run literally out of someone’s basement that you would dial up to and play games like Trade Wars, but the BBSes would also have internal messaging systems so you could communicate with other users. Where computing in those early days really got interesting was when services like CompuServe started to take off. CompuServe was filled with forums built around different subjects, and it allowed you to communicate with people from all over the world about the subjects that interested you the most. There was also a section called “CB Talk” which was based on the idea of old CB radios, but each “channel” was about a different subject, and viola, you had your first chat rooms for chatting with people about all manners of subjects. 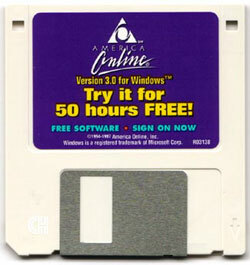 In the 1990’s you couldn’t buy a magazine without an AOL floppy disk (and later CDs) falling out of it. However, say what you will about “AOLHell” as it was fondly known, it did change the online landscape forever. Some feel it did horrible things to it, but it made people feel comfortable with the concept of going online, and without it, there is no way Facebook would be at 350 million users today. But, I digress and brought up Facebook too early. Friendster’s launch in 2002 saw the beginnings of what we currently know as social networks, and though its reign as the king was short, it was an important one. Without Friendster who knows if we would have had MySpace, Hi5, Bebo, Orkut and so on. And of course, the king of all kings, Facebook with its staggering hundreds of millions of members. Sure this history isn’t complete because you would also delve into things like Usenet if you wanted to get nitpicky on the definition of the term “social networking”, but I’m also not trying to write an opus here. Now comes the fun part: the future. The first decade of the 21st century were an exciting time for social networking, but where is it going now? Is there an question that mobility is going to play a bigger part in social networking? Everyone wants Facebook on every device. You can’t hardly go to any social media blog without reading about Foursquare. Mobile is where it’s at and it will just become even more so as the devices get faster and more powerful. Facebook is going to topple under its own weight. Do we really need to see the updates of every single person in our networks? Do you really know who you’re talking to on a social network? Transparency in identity is going to become paramount. Facebook has solved some of this problem compared to the days of the fake MySpace accounts, but even it still has the problem of being gamed. How this will be solved is still unknown, but people are going to want proof of who they are talking to. At some point people are just going to get tired of not talking to people face-to-face period. Many pundits have called for the death of the business card and just want to know how to connect to you on a social network. Well, maybe I’m old school, but I still want to look a person in the eye when I make a business deal with someone, and I think that is going to carry over to all aspects of life eventually. You can still augment your real life connections with the online aspect, but getting to know people in real life will always trump it. Things are changing so rapidly in technology these days that is almost impossible to know where exactly all of this will end up. Ask me in a week what I think the future of social networking is and I may have a completely different answer for you. For now, these are my thoughts, where do you see social networking going next?